BBC Sport has launched a new homepage and football page as part of our work to provide you with a more consistent experience whether you are on a computer, tablet or mobile. On desktop and laptops, these new versions are wider than the old design to make the most of the dimensions of modern computer screens. Following on from our initial launch, which also included our Scotland, Wales and Northern Ireland home pages, we have applied this design to a variety of indexes, including Formula 1, cricket, rugby union, rugby league, golf, tennis, athletics and cycling. You can read more about the process behind the new designs here. We are completing the process of switching BBC Sport over to a responsive design - this means pages adapt automatically to the screen size of the device you are looking at it on. This move will allow us to provide the same content irrespective of the device a user is looking at the site on, giving visitors the best experience no matter how they are looking at the site. What improvements are there in the new designs? The differences will be most apparent to visitors of the desktop site: the biggest being that, while previously many stories were shown as part of a list of headlines, now more of the content has an accompanying image and stories are more spaced out on the page. 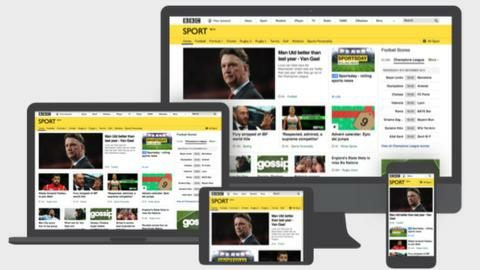 The new layouts are designed to take account of the wider screens used by desktop computers, allowing us to present a richer experience for you as you visit the main sport and football pages. They also feature new scores and league tables, designed to provide the same experience you can find in our coverage elsewhere on the site. Our Scotland, Wales and Northern Ireland pages will also change, to reflect the new designs brought in elsewhere on BBC Sport in recent weeks. No. We will still cover these sports in the same way. The new designs will ensure the same content is available on all devices, whereas previously some items only appeared on larger screens. Although the new designs are unique to the main sport and football indexes, we have already made most of our pages responsive across BBC Sport over the past few months, with your feedback helping to shape the work that has been done. We have also switched across all the story and video pages on the website, and have used responsive pages for our live events, such as Saturday football commentaries, Test cricket and Wimbledon since last year, so you may well have experienced these changes already. We welcome all feedback on the new design - simply contact us via our feedback form.